Def Leppard play another show on the 2015 World Tour tonight in Birmingham, England and updates will appear live right here. This page will feature updates as and when they happen from this show including the setlist. Keep refreshing the page for more updates. Setlist and live pics to appear here courtesy of fans at the show. BLOG ENDED - Starts at 9:05pm UK Time (after WS end). Find out what time it is where you are. The main show page will be updated after the show with a setlist and any reviews/pics. 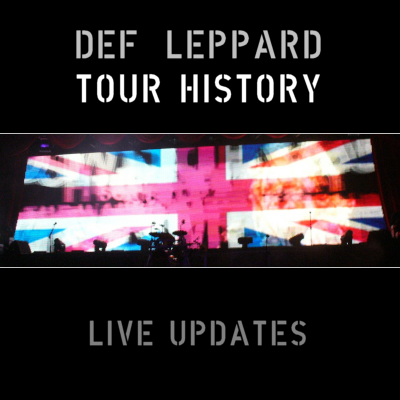 Any contributions are welcomed to the Def Leppard Tour History. 10:59pm (Local Time) - Until next time see ya!. All further photo/videos will be added in news updates. 10:47pm (Local Time) - Def Leppard Song 16 - 'Photograph' - up next to finish. 10:23pm (Local Time) - Joe slagging off Coventry City, probably before TSB. Sheff Utd are currently 12th in League One (the third division of English football). And Coventry City are - 2nd. They also had a chairman called - Joe Elliott in 2007. @DefLeppard joe Elliot not a @Coventry_City fan but shame on you for slagging them off tonight. #thirddivisionscum indeed. 10:02pm (Local Time) - Basing these times from the last show - not a lot coming through right now. 9:37pm (Local Time) - As with the last show starting a little earlier than 9:35pm. 9:18pm (Local Time) - SKY TV's Formula One commentator David Croft pictured below. He recently tweeted about having 'Dangerous' on his Spotify playlist. 6:00pm (Local Time) - Tonight's show is number 97 in 2015 and the first show in Birmingham since December 2011. 6:00pm (Local Time) - Updates LIVE TONIGHT. Expect updates when available and closer to show time. New updates will appear above this, each with a new time. Refresh to keep seeing them.